Biocompatibility testing, engineering artificial organs and tissues, developing new drug delivery systems, creating or modifying innovative medical devices, enhancing medical imaging techniques, or designing procedures to meet regulatory requirements are just a few examples of the work performed by a biomedical engineer to improve the health and well-being of others. Biomedical engineers combine their knowledge of engineering with biology, anatomy, and physiology to create devices and systems for a variety of healthcare issues. The need for sophisticated diagnostic and therapeutic equipment and solutions has fueled the demand for biomedical engineers who commonly work in multidisciplinary teams to develop devices, equipment, and procedures for a number of medical applications. The multidisciplinary nature of biomedical engineering requires professionals to develop an expertise in both engineering and biological sciences. Biomedical engineering applies the principles and theories of engineering to solve problems in the wide-ranging field of medicine. Biomedical engineers can be found working alongside scientists, other engineering professionals, and medical practitioners to evaluate the complex, interdependent systems of the human body to develop effective solutions to enhance the quality of life for all patients. Biomedical engineers play a key role in developing and defining the engineering requirements and specifications necessary to actually bring these devices and protocols to fruition. It is a rapidly growing field with a variety of career opportunities for students with an interest in combining engineering with medicine. To educate and train graduates who are technically competent and are prepared to apply knowledge in traditional and modern application domains. Additionally, they will possess a broad education and knowledge of contemporary issues that enable them to anticipate change and continually update their skills. They will also be able to communicate and work effectively with others in a professional and ethical manner to function as a biomedical engineer in a globally-connected society. To prepare graduates to either enter directly into the work force as technically competent and sought-after professionals with reinforcement from experiential learning, or to prepare them with the fundamental knowledge to continue their education in graduate programs. Student Centered: Our department makes decisions and behaves in a manner that demonstrates the primary importance of the students’ needs and interests. Community: The department is a close-knit community characterized by respect for its differences, inclusion of a diverse set of ideas and people, and friendly collaboration among the faculty, staff, and students. Teaching Excellence: To demonstrate continuous excellence and innovation in how we deliver classes to our students, and the support we provide our students outside of class. 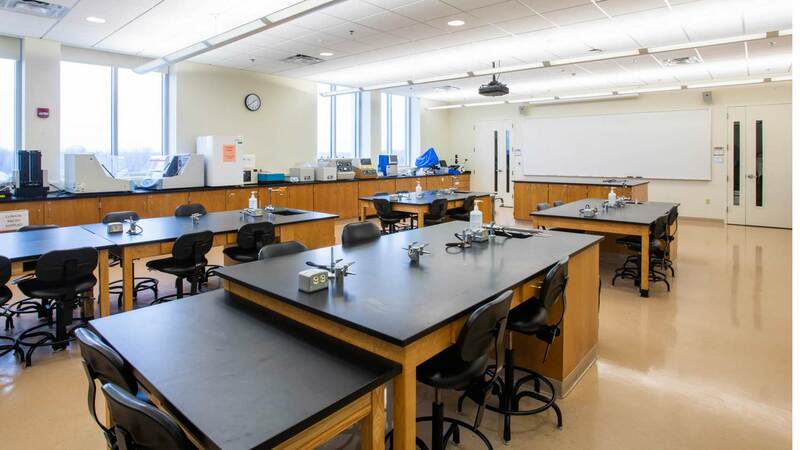 Experiential Learning: To provide experiential learning throughout the undergraduate curricula via cooperative education, relevant projects, and practical experiences in state-of-the-art labs. Research: Faculty members will conduct studies that encompass a vast spectrum of the biomedical field, allowing students to engage in innovative research opportunities. The BS degree in biomedical engineering is accredited by the Engineering Accreditation Commission of ABET, www.abet.org. For Enrollment and Graduation Data, Program Educational Objectives, and Student Outcomes, please visit the college’s accreditation page. To help ensure that industry needs are satisfied through the proper training and education of biomedical engineering students, an annual meeting is held with the members of the industrial advisory board. The board is comprised of professionals from all areas of biomedical engineering, and also includes some RIT alumni as well. Biological Fluid Mechanics Laboratory – This research group is interested in using state of the art experimental and computational methods to both understand the behavior of naturally occurring flows as well as to guide the design process of medical devices. One particular focus area in the laboratory is blood contacting medical devices; more specifically we are studying the effects that fluid flow can have on the performance of these devices, as well as cell damage induced by the flowing fluid. This work has led to several successfully funded research programs through government and industry partners that have supported dozens of students. Projects have included the design, prototyping, and testing of implantable blood pumps, the understanding of the mechanism of fluid shear on damage to red blood cells, and the analysis of flow during human respiration and during suction feeding. The Biomedical Modeling, Visualization and Image-guided Navigation – The Biomedical Modeling, Visualization and Image-guided Navigation Laboratory focuses on the discovery and development of innovative imaging, navigation and visualization techniques and instrumentation to improve the understanding, diagnosis and treatment of human diseases through minimally or non-invasive approaches, conducting research across several broad themes. Our research interests have focused on exploring the use of medical imaging to generate new paradigms for image-guided visualization and navigation for minimally invasive therapy. Cardiac interventions, for instance, have been among the last disciplines to benefit from minimally invasive treatment techniques, mainly due to the challenges associated with access and visualization inside the beating heart. Our research endeavors entail both technologies (image acquisition, surgical tracking, visualization and display) and techniques (image analysis, modeling, evaluation and validation) to advance the development, evaluation and pre-clinical integration of image guidance environments for surgical navigation of minimally invasive cardiac interventions. The lab draws on the strong engineering community within RIT as well as local and international clinical research collaborations with Columbia University, University of Rochester, Brighton Sussex Medical University, Leiden University Medical Center, and University of Oxford. Microscale BioSeparations Lab – The Microscale BioSeparations (MSB) Lab is a research group working on separation, sorting, and detection techniques of nano and microbioparticles, such as macromolecules and cells. We employ electric field driven techniques (dielectroforesis, electrophoresis, and electroosmosis) in microfluidic devices. This is a very multidisciplinary area that combines microfluidics, electric fields, chemistry, and biology. The main objective is to develop robust and rapid microfluidic-based techniques to offer an alternative to traditional bench scale analytic/separation/purification processes. The ultimate goal is to contribute to the field of lab on a chip technology to enable creation of truly portable laboratories. Work is carried out with a wide array of bioparticles, from proteins and DNA to virus and many types of bacterial and yeast cells. Projects involve both experimental work and mathematical modeling with powerful COMSOL (Burlington, Ma.) Multiphysics Modeling Software. Currently there are several projects focusing on the manipulation of microparticles and cells with low frequency AC electric fields and on the understanding of the forces that generate dielectrophoretic capture of microparticles in microdevices. The research efforts have been supported with funding from the National Science Foundation (NSF). Nanomembranes and Nanomanufacturing: We are researching the fabrication of ultrathin nano- and micro-porous membranes. These membranes are typically 1/1000th the thickness of a human hair with well controlled pore sizes. Part of our work focuses on the science behind manufacturing scale-up of nanomaterials, which typically have very low yields at extraordinary cost. The National Science Foundation has funded our laboratory’s efforts to develop nano manufacturing scale-up techniques to help integrate nanomembranes into miniaturized hemodialysis cartridges. Physiological Barrier Models and Cellular Microenvironments: We are using ultrathin membranes to enable development of tissue-on-a-chip barrier models and co-culture systems to better mimic the human body. The ultrathin nature of the membranes not only enables improved physiological processes, but also optical, electrical and biochemical analysis of barrier properties to understand drug transport and cell migration. Furthermore, we can control and manipulate physical and biochemical cell-cell interactions by tuning membrane pore sizes and membrane thickness at the nanometer and micrometer scales. Biological Separations: An ultrathin membrane is an ideal sieve due to the lack of internal voids and high permeability. We are using ultrathin nanoporous membranes to explore simplified purification methods of biomolecules that otherwise require complex and often low-yield processes. In combination with our goals of scalable nano manufacturing, we are exploring the purification of cellular exosomes and microvesicles from biofluids. We have also begun research utilizing graphene oxide nano laminates to purify water-soluble and albumin-bound toxins from blood for kidney dialysis and liver support technologies in collaboration with Saeed Moghaddam at the University of Florida. Recent Publications – Take a look at a list of recent publications by our faculty researchers. The biomedical engineering BS degree is a five-year program that incorporates almost a year of cooperative education experience. We also offer an accelerated dual degree option where students can earn a BS in biomedical engineering and an MS in science, technology and public policy in approximately five years. Biocompatibility testing, designing artificial organs and tissues, developing new drug delivery systems, creating innovative medical devices, and enhancing medical imaging techniques are just a few of the ways biomedical engineers improve the health and well-being of others. RIT BioPrint – The mission of the RIT BioPrint club is to provide an interdisciplinary environment geared toward bringing together students from different fields of interest and expertise with the overall goal of learning from one another in a real world, hands-on application environment. Biomedical Engineering Society – the Biomedical Engineering Society is the professional society for biomedical engineering and bioengineering. Founded in early 1968, the society now boasts more than 7,000 members and is growing rapidly. Engineering World Health – Engineering World Health inspires, educates, and empowers young engineers, scientists, and medical professionals from more developed parts of the world to use their engineering skills to improve global health. The Biomedical Engineering Department offers a variety of resources for our students that vary from academic support to handbooks and more. Visit our Student Resources page for more information.